For the video game, see Disney's Herbie: Fully Loaded. Herbie: Fully Loaded is a 2005 American sports-comedy film directed by Angela Robinson and produced by Robert Simonds for Walt Disney Pictures. It stars Lindsay Lohan as the youngest member of an automobile-racing family, Justin Long as her best friend and mechanic, Michael Keaton as her father, Breckin Meyer as her brother, and Matt Dillon as a competing racer. The film features cameos by many NASCAR drivers, including Jeff Gordon, Jimmie Johnson, Tony Stewart, Dale Earnhardt Jr. and Mark Martin. It is the sixth and final installment of the Herbie franchise, following the television film The Love Bug (1997) and the only theatrical Herbie film since Herbie Goes Bananas (1980). This film serves as a direct sequel to the original films and ignores the events from the fifth film The Love Bug. The film was released on June 22, 2005 and grossed over $144 million worldwide. Maggie Peyton (Lohan) is an aspiring race car driver. Maggie's family includes her brother, Ray Jr., and her father, Ray Sr., who are members of their namesake's racing team. Herbie, a Volkswagen Beetle, is towed to a junkyard after losing several races, and Ray Sr. takes Maggie to the junkyard to buy her a car as a college graduation present. After Maggie selects Herbie, she finds an anonymous note in Herbie's glove box, possibly written by Herbie's old owner Jim Douglas (Herbie's original owner from The Love Bug (1968) and Herbie Goes to Monte Carlo) which reads: "Please take care of Herbie. Whatever your problem, he'll help you find the answer". Herbie takes her against her will to the garage where her old friend Kevin works as a mechanic. Kevin has Maggie take Herbie to a car show to buy parts for Herbie, but when they arrive, Herbie tricks Maggie into disguising herself in a racing suit and helmet and challenging NASCAR champion Trip Murphy to an important race, which Herbie wins by a second. This delights Kevin, who tries to talk Maggie into racing again. However, Ray Sr., who has forbidden her from racing since she was hospitalized after a street racing accident years ago, is concerned. It also infuriates Trip, who becomes obsessed with Herbie. Trip organizes a local street-racing competition to lure Herbie back for a rematch, which Maggie and Kevin enter. Herbie easily defeats the other cars and qualifies for the final match with Trip, but when Trip talks Maggie into racing for pinks (where the winner takes possession of the opponent's car), Herbie becomes alarmed over Maggie's desire to win Trip's stock car. In addition to being deeply hurt by Maggie's earlier assertion that driving in Trip’s car was the best ride of her life, Herbie incorrectly assumes that Maggie will reject him if she wins the other car, and also is unaware that Trip only agreed to the match so that he could have Herbie scrapped if he got possession of him. Consequently, Herbie intentionally loses the race against Trip in his Corvette C6 Z06, causing Maggie to be humiliated, Herbie being towed away by Trip, Kevin being disappointed in Maggie, and Ray Sr. lecturing Maggie for racing without his permission. However, encouraged by her friend Charisma, Maggie decides to race professionally. She tries to buy Herbie back from Trip, but Trip has entered Herbie in a demolition derby. Desperate to save Herbie from destruction, Maggie goes to the derby, runs onto the field while the derby is in progress, pleads with Herbie to help her, and wins the derby. Meanwhile, Team Peyton may have to forfeit an upcoming stock-car race due to financial troubles and two crashes by Ray Jr., one of which leaves him with a depth perception problem, rendering him unable to race. Ray Sr. declines Maggie's offer to drive for the team, but Ray Jr. allows her to take his place and sends the Team Peyton crew to help her and Kevin prepare Herbie for the race. At the race track, Maggie and Herbie have a heart-to-heart conversation, and Trip ominously warns Maggie that the race will be dangerous. Herbie starts the race slowly, but he eventually catches up and begins passing the other cars before Maggie makes her first pit stop. While watching the race at home, Ray Sr. decides to watch the race in person. On the track again, Herbie is soon boxed in by some other cars, but Ray Sr. arrives at the track and encourages Maggie over the team radio, and Maggie escapes the trap by driving directly over Tony Stewart who was in front of her. This damages Herbie's oil system, so Maggie makes another pit stop and Kevin hurriedly extracts a replacement part from a yellow New Beetle, which Herbie has been eyeing amorously throughout the film, owned by Sally, one of Team Peyton's few remaining sponsors, switching it with Herbie's. The jerry-rigged oil system is fragile, and Trip is intent on preventing Herbie from winning. With Maggie, Herbie, and Ray Sr. now working together, Maggie and Herbie catch up to Trip. Trip tries to damage Herbie by pushing him into the track wall when Maggie tries to pass him, but he is caught off guard and crashes into the wall when she slams on the brakes during his next attempt, causing Trip's car to ricochet off the wall and hit Jeff Gordon's car, flipping his over. Herbie passes Trip's car, now upside down on the track, by climbing onto the catch fence above the wall and riding it all the way to the finish line. After landing back on the track, Maggie and Herbie win the race. Maggie is congratulated by her father and brother, and Trip is hospitalized for trying to tell everyone Herbie's alive as Maggie and Kevin kiss. Later, Ray Sr. warns Herbie and Sally's New Beetle not to stay out too long on their date. Herbie and his love then drive off into the night, ending the movie and rolling the credits. Lindsay Lohan as Maggie Peyton, a young auto racer and Herbie's new owner. Many racing professionals appear as themselves in cameo roles. These include announcer Allen Bestwick and 1973 NASCAR champion Benny Parsons, and ESPN broadcaster Stuart Scott. Director Angela Robinson, stated in an interview that she attempted to have Dean Jones reprise his role as Jim Douglas for a cameo, but due to scheduling problems he was unable to do so. This circulated false rumors alleging Jones had filmed the cameo and the scene had been deleted. 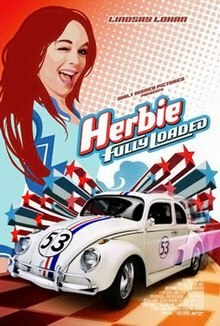 As of 2015, the film holds a 41% rating at Rotten Tomatoes based on 143 reviews, with the critics' consensus saying that "Herbie: Fully Loaded is a decent kids movie that is pretty undemanding for adult viewers." In its opening weekend, the film grossed $12,709,221 million in 3,521 theaters in the United States and Canada, ranking #4 at the box office. By the end of its run, Herbie: Fully Loaded grossed $66,023,816 domestically and $78,123,000 internationally, totaling $144,146,816 worldwide. At the 2006 Kids' Choice Awards, Lindsay Lohan won Favorite Female Actress for her role. The film was also nominated for Favorite Movie but lost to Harry Potter and the Goblet of Fire. The film was reported to include heavy uses of product placement. For example, Maggie Peyton is a former reporter for ESPN (owned by Disney) turned NASCAR driver. A huge billboard for Mid America Motorworks (an aftermarket parts supplier for classic Volkswagens and other vehicles) is seen in the background of the scene where Murphy attempts to sabotage Herbie. In addition, Volkswagen provided a Volkswagen Touareg and a Volkswagen New Beetle for use in certain scenes. Various race cars in the then-NASCAR NEXTEL Cup Series appear during the NASCAR race at the end, (which is shown to be the 2004 Pop Secret 500, during which Herbie: Fully Loaded was filmed) which have various sponsorship decals on the cars. (Dale Earnhardt Jr's #8 car is seen briefly, but it has all the Budweiser logos removed and replaced with his signature to avoid advertising alcohol in a children's film). In addition, billboards can be seen in straightaway scenes, some with the NEXTEL logo on them. The soundtrack album was released on June 21, 2005. It includes Lindsay Lohan's third single, "First", and remakes of classic songs by Walt Disney Records artists including Aly & A.J., Caleigh Peters, Ingram Hill and Josh Kelley, and big names such as Lionel Richie and Mark McGrath. The album does not, however, contain any of Mark Mothersbaugh's original score for the film. Mostly, the songs' original recordings were used in the film while the soundtrack contained the remakes. For example, The Beach Boys' original recording of "Getcha Back" is used for the film's opening credits, but the Mark McGrath cover is featured on the soundtrack. The Girls Aloud single "Long Hot Summer" was planned to be included, but was cut from the final film. Sol Seppy - "Nice Car"
Black Smoke Organization – "Herbie vs. NASCAR"
^ a b "Herbie: Fully Loaded (2005)". Box Office Mojo. Retrieved 2011-07-27. ^ "An Interview with Angela Robinson". UltimateDisney.com. October 21, 2005. Archived from the original on July 14, 2011. Retrieved January 14, 2016. ^ "Herbie: Fully Loaded". RottenTomatoes.com. ^ Johnson, Ross (July 6, 2005). "Product Placement for the Whole Family". Movies. New York Times. Archived from the original on May 29, 2015.